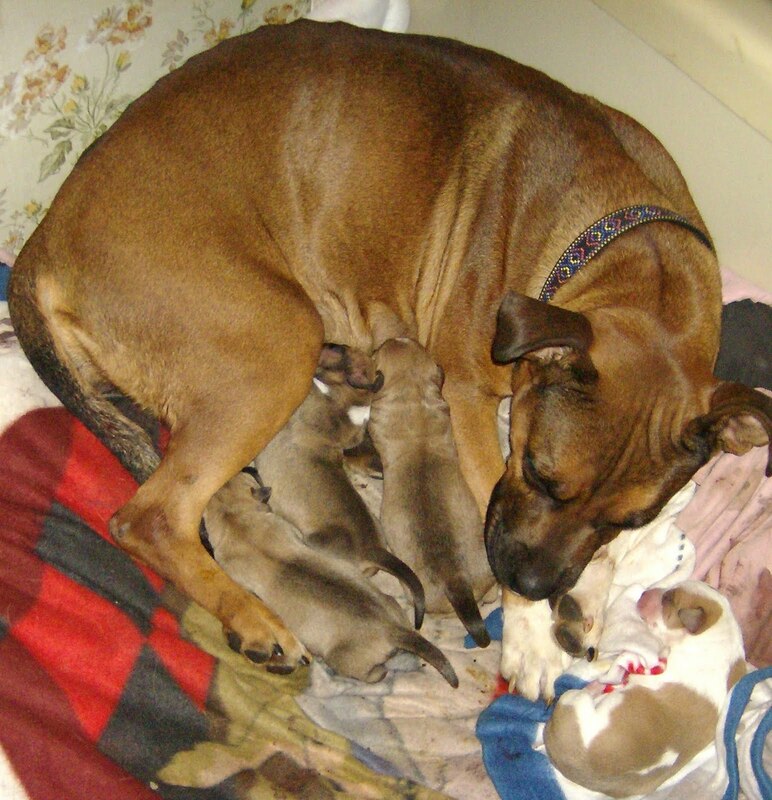 Here is a picture of momma dog and 4 little puppies. Momma isn't a very big dog. I would call her medium. The pups will probably be medium sized too. I was so tired at work today that I closed my door and put my head down on my desk. I actually fell asleep for a few minutes. Good thing I only have one day left until the weekend. The rest of the afternoon was fueled by a Coke and I can still feel the caffeine. I managed to get a few important things done at work and more importantly, I think I did them correctly for a change. I am trying to be more detail oriented...as time allows. I have discovered that more foster dogs greatly increase the amount of phone and email inquiries for dogs. Most of those people are just looking and waste a lot of my time. I took a dog to work with me today because someone didn't want to wait until the adoption event on Saturday. They never showed up or even called. I don't think I should put my job in jeopardy by taking dog calls at work or arranging dog meeting during work hours. From now on, if I don't recognise the phone number it can go to voice mail. I think I should put a message on my voice mail that says they can see my dogs on Saturday at the pet store although I really don't want to spend every Saturday there. Maybe I should say every other Saturday. Anyway, I need to have some sort of system. With this many dogs I don't have time to play around! Awwww, those pups are so cute!! How does your cat feel about all of these dogs? Susch cute puppies. Those dogs are lucky to have to as a foster mom. Petunia, my cat is still queen of the RV and the dogs are all in the mobile home so she is blissfully unaware. Thanks Nelson and Boober. I'm just glad she is a good momma.